We spent a pleasant day exploring on our micro-adventure to the Forteresse de Salses, so much history and beautiful military architecture to enjoy and learn about! 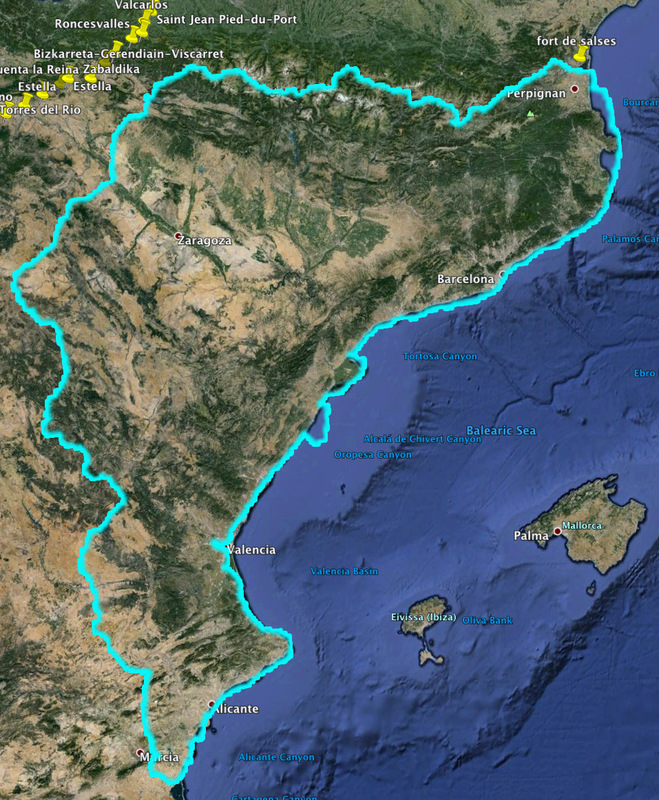 The Kingdom of Aragon in 1496, Forteresse de Salses is on the northernmost point. In 1496, the French army sacked and razed the village and castle of Salses which marked the northern boundary of the Spanish territory of Aragon, an area known as Roussillon. To block access between Roussillon and France more effectively King Ferdinand II (who married Queen Isabella in 1469) decided to rebuild Salses and make it a strong defensive barrier and a base for attacks. The construction happened in a relatively short amount of time between 1497 and 1504 (just 5 years after Columbus went in search of India and found North America). In 1503, the Spanish withstood their first siege although the fortress was not yet completed. Isabella died in 1504, Ferdinand died in 1516. In 1544, a peace treaty was signed bringing a century of tranquility to the area. The fortress gradually lost the military superiority its original, innovative design had given it. During the 30 Years War (1618-1648), Salses was besieged three times in three years before finally being taken by the French in 1642. The Treaty of the Pyrenees in 1659 ratified Roussillon’s status as French property. The area where we live today is still called the Languedoc-Roussillon region. The treaty moved border between France and Spain to the highest point of the Eastern Pyrenees and the fortress lost all military strategic importance. The only reason it survives is because of the cost of demolition, it was just too expensive to tear it down. It was partially restored by Vauban (you may remember we mentioned him in an earlier post about Port-Vendre) and became an observation post, then a State prison. Throughout the 19th century it was used as a gunpowder store before being classified as a historic monument in 1886. The Forteresse de Salses is a good example of the transition between medieval castle (with a keep and towers at the corners of long curtain walls) and the modern geometric fortress sunk into the ground and surrounded by a large moat. Many of the innovative features were necessary to keep up with changing developments in artillery, specifically the use of metal cannonballs. The outer walls are 6 to 10 meters (20 to 32 feet) thick and are buried to half their height in a huge moat than could be flooded. Above the ground, buildings rise between three and seven stories, served by a maze of passageways. The interior buildings are preceded by forward defense posts, three cylindrical flanking towers with a pointed bastion (making them resemble medieval helmets). The bastioned front, made by building a point in the outward facing circular tower wall, allowed for greater visibility of the surrounding area giving the guards a greater advantage to see enemies coming. These were connected to the main complex by caponnières — vaulted galleries linking the forward defenses and main buildings by way of underground tunnels. My diagram showing the parts of the exterior defenses. Here is what they look like from ground level. Alan standing inside the barbacane (13) with the south half-moon tower (10) entrance in the background. Artillery cavalier of the north wall. The keep (8) with part of the crenellated curtain wall (on right). Northwest tower (6) and part of the curtain wall (on right). View of the northwest tower (6) in the foreground with the southwest tower in the background. Alan in front of the keep (8) and the southwest tower (9). Two caponniere (3) between the northwest bastion and the northwest tower. The east bastion (2) with the northeast angle tower (4) in the background. The south half-moon towers (10) seen from the southeast with the south bastion (12) to the right. The south bastion (12) seen from edge of the outer moat. To the far right is an area that may have been an outdoor fireplace or storage area. Detail of the facade of the defensive structure (14) showing the cut-out areas for pouring nasty things on besieging armies. These marks on the interior doorway of the defensive structure (14) may have been caused by the locking of the gate that once guarded the entry to the barbacane (13). South half-moon towers (10), the former drawbridge (11) has been replaced with a more tourist friendly bridge. Between the two towers is the crest of Aragon. Heavily damaged not much of it remains. Gated entrance to the south bastion (12) [now a gift shop] from the barbacane (13). The portcullis has been replaced with a replica with a standard door built into it. The two chutes at the top were used to defend the bastion. Tracy at the sentry post structure (16) with the path to the defensive structure (15) on the right. Tracy standing in front of the northeast angle tower (6). The defensive structure (14). It is the entrance to the barbacane (13). Above the portcullis the empty areas of the facade have chutes to poor pitch, naptha or hot oil on besieges armies. The drawbridge (15) above the moat has been replaced with a more permanent walkway. Ceiling of the defensive structure (14) just before the barbacane (13). A small black cat sits in front of the entrance to the south bastion (12) [now a gift shop] in the interior of the barbacane (13). Signage for the barbacane (13). Alan standing in the sentry post structure (16). Alan in front of the southeast angle tower (1). The northeast angle tower (6) is in the center rear and the east bastion is on the right (2). Entrance to the interior of the fort is gained by crossing the moat, passing through the defensive structure, walking through the barbacane, going through the south bastion, crossing the moat again and heading to the entrance gate, which has two guard turrets. Passing through this gate leads to a short labyrinth of interior gates, each of the two additional gates is 5 to 6 inches thick. Passing through the second interior gate and crossing one final drawbridge finally gains access to the large, paved courtyard with a well in the center. The courtyard is bordered on three sides by an arcaded portico. The fourth side by an inner moat and a rampart that was never completed. The southwest tower was built over an existing artesian well which supplied much of the water for the fort. The three arcaded wings of the courtyard contained basement stable facilities for the 100 horses who lived within the fort. Ramps at regular intervals allowed the large animals to come and go from their basement homes. The interior walls of the stable still have feed bins and an occasional tie-down ring mounted in the wall which can still be seen. There were also chutes between some of the feed bins which would have allowed fresh water to be dumped into a receptacle within the stables for the horses. The chutes provided the only light in the stables other than the gated ramps. Above the stables inside the three wings were the remains of the barracks. Three stories of lodging would have filled up with the 1500 soldiers who lived in the fort. However, all that is still visible are the empty spaces in the walls where wood beams would have been to hold up the floorboards. Inside the northeast tower is a spacious chapel. A two-story single nave construction with a choir loft to the rear and an ambo built along the edge next to the stairs. There is a large facade behind the altar. Behind the altar facade is a large storage space and a staircase which leads down to food storage and an another interior well. There are three small chapels built into the basement. These days the chapels hold a small display of artifacts depicting food storage and tools of the medieval fort. At about the halfway point of the north wing and just before the small bridge to the gated inner keep area there was a grainery and the forge. Neither of which are accessible to tourists. Sometimes you just have to use your imagination! The inner keep area between the unfinished rampart encompasses the entire west wing, part of the north wing, south wing and both the northwest and southwest towers. The southwest tower was specifically placed over an artesian well which provided running water for the entire fort, including the kitchen, the boulangerie (bakery) and what looked to be a bathing room with two stone tubs as well as the inner moat and both the central courtyard well and the chapel well. The area in front of the Chamber des Vannes (bathing room) had cool air blowing out, so cold that it was like standing in front of an air conditioner! And I always think of these old forts as hot in the summer and cold and drafty in the winter . . . hmm, maybe not so much! Entrance into the inner keep was made through another huge gate in the wall of the unfinished rampart. I read later that this was the last line of defense if the fort were ever taken. All of the food and cooking areas are included inside as well as that hidden well in the southwest tower. 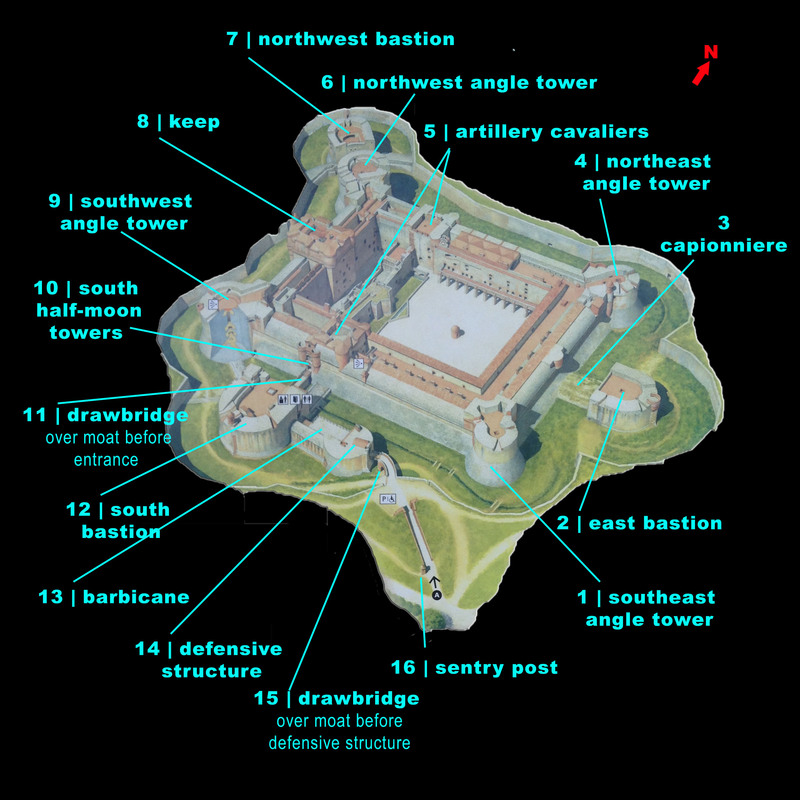 So if the fort was taken by enemies the soldiers and others could barricade themselves in the inner keep where they might be able to hold off invaders. There was also an underground tunnel from the northwest bastion to the northwest tower, so I assume there may have been an escape route planned from there as well. In the center of the west wing was the keep, a seven story building that housed the dungeon, food stores, kitchen staff, and artillery with access to the roof for guard duty. To the left of the keep was the shop, this may have been the weakest point of the inner keep as the west wing changed there to just the curtain wall — well weak is subjective, the walls are some 30 feet thick. To the right of the keep is a huge boulangerie (bakery) easily large enough to house 20 workers. There are hundreds of hand-sized terra cotta balls piled everywhere, on the floor, the large stone table, and inside the ovens. The terra cotta balls were used to bake bread on. They were heated in a fireplace then placed onto the floor of the oven, when they started to cool they were removed and hot ones were added. There were six of the ovens, small fireplace/bbq size one of which still have black soot inside and on the ceiling above it. My guess is that’s where the terra cotta balls were heated. Three of the ovens were along the north side of the room above a huge stone table large enough to make hundreds of small bread loaves. Uneaten bread was left to harden and became bowls for the next meal, like how some restaurants use a sourdough bread bowls for clam chowder. Built at the ground level of the interior rampart was the kitchen — with running water and a stone sink an enormous fireplace. The wall facing the courtyard had a long horizontal opening about 8 inches tall. This was to be used in case enemies breached the courtyard — soldiers could still shoot at them through the opening in the kitchen. Next to the kitchen was the barn for horses and dairy cows. An opening between the two allowed air to flow but I can’t imagine in helped make things smell better. Though if they used the area to butcher the cows then at least the kitchen staff would have immediate access to begin cooking dinner. The western side of the north wing that was part of the inner keep was one large room with a small room at the west wall with a small door and a small pass-through window, originally I thought it might be a jail cell but we read in the history pamphlet that the dungeon was in the keep. So we are still clueless as to what was kept in there. There were stairs leading down into an underground room, but it was closed to tourists. We do know that there were two caponnieres from the northwest bastion to the northwest tower, perhaps the stairway lead to these underground passages. Bell inside the final labyrinthed entrance to the courtyard. After passing through the final gate of the entrance there is one last drawbridge to cross before entering the courtyard. 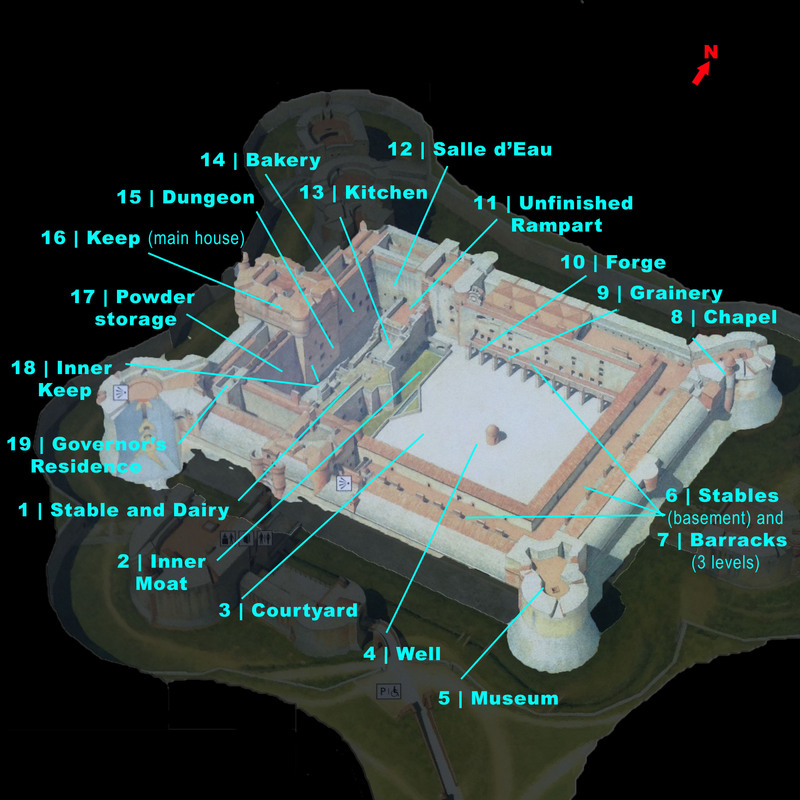 (1) Stable and Dairy: the interior of the stable and dairy of the inner keep area. (2) Inner Moat: the walkway above the arches of the inner moat could be burned or torn down to deter attacks against the inner keep. (2) Inner moat: the running water in the bottom could also be used to flood the small inner moat. (3) Courtyard viewed from the inner keep gate. (4) Well: the central courtyard well. (5) Museum: children entering the museum inside the southeast tower. (6) Stables: Tracy entering the basement stables via the ramp. (6) Stables: the feed troughs for horses in the basement stables. (6) Stables: ramp and interior of the basement stables. (7) Barracks: the holes for beams which would have held up floorboards for the upper levels. (7) Barracks: the ground floor of the once three-storied living quarters. (7) Barracks: windows for the upper levels. (7) Barracks: staircase leading to the missing upper floors of the barracks have been worn down by hundreds of soldiers. (8) Chapel: the choir loft (right), staircase (left) and ambo (far left). (8) Chapel: interior of the chapel with great facade (left), ambo and staircase (right). (9) and (10) Grainery and Forge: the ground floor entrances to both the grainery and forge with the clocktower far above. Clocktower above the arcaded portico which once housed the forge and the grainery. (11) Unfinished Rampart: if completed this would have allowed quick access between the south and north wings of the fort as well as a defensive structure if the courtyard was breached. Unidentified room inside the northwest tower. The pass-through window inside the room at the northwest corner of the inner keep. (12) Salle d’eau or Chamber des Vannes: bathing area with running water. (13) Kitchen: signage for the cuisines (kitchen). (13) Kitchen: huge hearth and small fireplace ovens in the kitchen. (13) Kitchen: interior of the kitchen showing the water system in the floor and a broken stone sink (left). (14) Bakery: three of the small baking ovens. (14) Boulangerie (Bakery): hundreds of terracotta balls used for baking. (15) Dungeon: signage for the donjon (dungeon). (16) Keep: the seven story keep which housed the dungeon and more. (19) Governor’s Residence: front door with stained glass.